Someone has been holding out on me. I didn't know the blog Chez V existed. 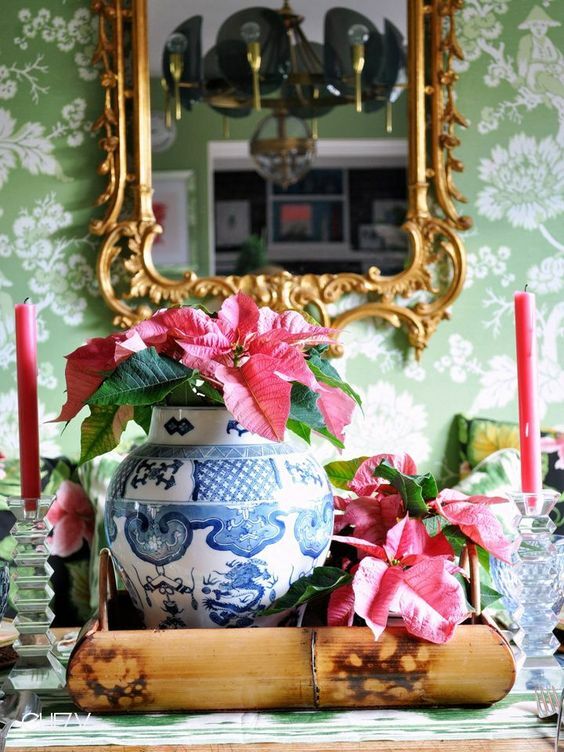 And although these photos are old news from 2014, they are perfectly relevant for any Chinoiserie-lover decorating for Christmas. I have never had hot pink poinsettias at Christmas...but this year I WILL. I am planning a whole Christmas table around them and I couldn't be more excited about it. And then I saw this picture. And I may never have another Christmas in my life without pink poinsettias. Aside from the pink plants, this whole Christmas situation above is amazing. The magnolia leaves, those stockings, the tree...all of it. We are getting a slow start to Christmas decorating this year, but I'm hoping to knock most of it out this weekend and will be referencing these photos as I go. I followed Chez V waaaay back and miss her blog posts. I beg her to start again!!! Her IG is good too - just not often enough :( Her bathroom was my inspiration for a One Room Challenge bathroom my daughter and I redecorated together!! I'm glad you found her - she kills it! !